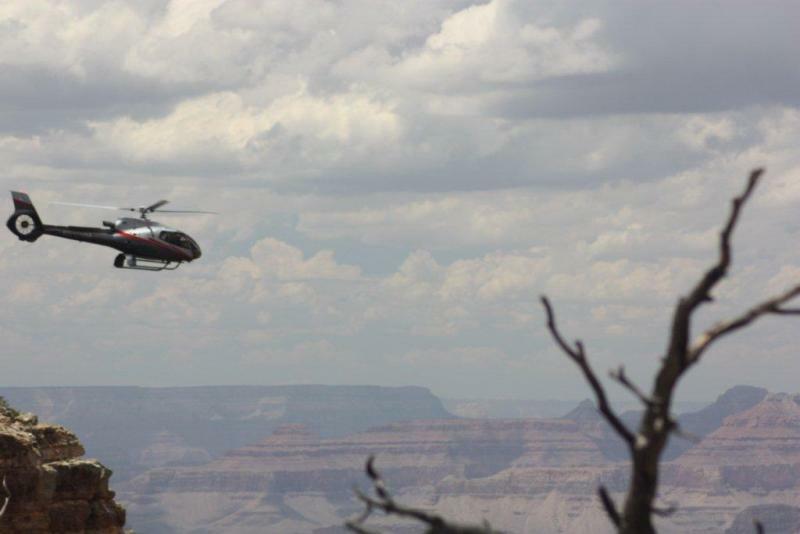 Meanwhile, for thirty years, helicopter tours over Grand Canyon National park and adjacent lands have increased. After recieving some large campaign contributions, this FEIS was blocked from release at the last minute in June 2012 by Senators McCain, Kyl, and Reid, along with Representative Heller. The result of the "midnight rider" was that aircraft flights over Grand Canyon were allowed to increase in number. Aircraft Tour operators were allowed to fly more flights as incentive for adopting “quiet technology” for their aircraft. At the same time, commercial flights (non-tour aviation) were excluded from official noise calculations. According to the Arizona Daily Sun, noise will no longer count if it comes from jetliners, military and delivery flights, along with thousands of flights into Hualapai Indian lands, or even the flights from Las Vegas to Tusayan that bring in most of the air tourists. - The parks were created to protect natural resources, including natural quiet. The parks were not created to promote commercial industries that adversely impact visitor experience of the Park's natural resources. - The Park should not allow an increase in overflights. To do so will take away the Park's ability to allow the public to hear natural quiet, an endangered resource in today's world. - In our industrialized society, it is important that we save a few places for contemplative recreation. Tourists from around the world come to America's national parks as they are the best place for contemplative recreation and personal renewal. Decreasing the number of overflights over Grand Canyon will help preserve this resource. - Tribal lands at the west and east ends of the Grand Canyon could continue to be exempt from annual flight allocations and daily caps. As these lands are increasingly impacted by more tour rides, it is even more important to protect peace and quiet inside the boundaries of Grand Canyon National Park. - All other recreation, including permits for river running, hiking, overnight visitation at Phantom Ranch and mule rides, has all been capped for decades to protect park resources. Since 1975, the number of air tour rides has increased almost tenfold. Tell the NPS the number of overflights should be reduced to the 1975 levels, when Congress first indicated there was a problem through the passage of the Grand Canyon Enlargement Act. - The 1987 Overflights Act dictates that there shall be no flights below the rim, yet flights are still allowed well below the rim. The Park Service should implement and enforce the law with no tour or passenger shuttle flights below the rim. - Encourage the NPS to increase the curfews (sunrise to first flight, and last flight to sundown) from as little as 14 minutes currently, to at least one hour after sunrise and before sunset, every day, all year, throughout the entire park. The air tour industry has considerable political clout. River runners who find natural quiet in Grand Canyon a valuable resource need to counter the air tour industry's push for more intrusive, noisy rides.